An approachable 3rd-person space sim with a vast, and often beautiful, universe to explore. Escape feels good. It’s a great thing space games are back, because I want to get off-world. And happily, Starpoint Gemini 2, the new open-universe, ship-centric RPG from Little Green Men Games, rewards the dreaming risk-takers as much as the steely-eyed, steady-handed pilots. Space-based tension aside, SG2 is one of the most positive and relaxing game experiences I’ve had in a long time. There are missions to complete, asteroids to mine, and trading to undertake, but the presentation of the game is so textured and accessible that I’ve spent much of my time with SG2 just exploring. I’m looking for that random encounter that brings me fortune—or folly. But that’s always been my favorite role: the detached, true-neutral scientist with beam weapons trained at your bridge. I’m here in the interest of peace and knowledge, until you mouth-off or make the wrong move. In my multi-year, on-again, off-again relationship with EVE Online—a game many players will compare to SG2—I usually feel just not-quite-committed-enough for the scale of it all. In contrast, SG2 is single-player and feels proud of it. The basic controls in SG2 will be familiar to EVE players, with a 360-degree camera view and variable zoom setting, as well as a variety of hot keys for skills and ship management. Although there is a turret view option that essentially sits you on the top of your ship, there’s no cockpit perspective in the game. When not docked at a planet or station, action takes place in real-time, so finding a comfortable setup is key to enjoying its take on the space genre. SG2 pushes me to grab a cool drink, crank up its wonderfully chill soundtrack and go for a ride (which I can always pause). With its third-person camera positioned at just the right angle, I feel present and in the moment, ready to ambush some overmatched pirates or cruise through a nebula in search of a new wormhole. It rewards my curiosity and ambition as much as it punishes my over-confidence with its limited save system and enemy difficulty scaling. SG2 is a genuine and grounded idea of what space could be. A dangerous vacuum, yes, but also an ecology of debris, machines, and energy fields that draws me in. SG2 comes with a free-roam mode and lets you pick an avatar portrait along with a class specialization focusing on multi-ship command, close-quarters gunnery, or engineered hacking prowess. The entire star map is waiting for you. If you pick the campaign option, however, you play as the remnant of the Gemini League, fighting your way to freedom and vengeance. In the campaign, I had to deal with the occasional game freeze and one stubbornly imbalanced story mission. The story is a useful, although sometimes buggy introduction to the various systems at play in SG2. And with its uneven voice acting and set-piece encounters, the crafted story of the Gemini League doesn’t feel like the main attraction. But just like in the free-roam mode, you can wander in the campaign. And wandering is glorious and the primary draw of Starpoint Gemini 2. By venturing out on my own, I get to write my own narrative. I encounter different enemies, anomalies, and factions, all of which require a different response. What do I do? Do I jettison this extremely valuable, but possibly ally-offending cargo of blade weapons in my hold, or try and sell it to fund my ambition for that ship upgrade or heavy weapon buff? Freelance side-missions also spawn randomly and offer up XP and credits, both valuable in order to upgrade to a new ship or improve the one I already have. I can take a chance on a higher-level assassination mission and be rewarded, or find out I’m hopelessly overmatched and be blown apart. Choices matter. A repair job takes me through a strange sector. But because it’s a single-player experience, second-chances are possible. Larger stations, where player starships can dock—or anchor—are placed strategically throughout the star map. These points are where I can save my game, put my ship in drydock for a refit, or customize my paint scheme. The loot system is key to meaningful ship upgrades, as I need to pay close attention to my items—are they illegal, valuable, or just junk? Occasionally I get scanned and my relationships to factions change if they see me as a smuggler or not. 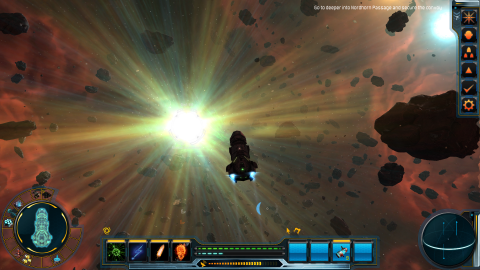 What I enjoy about Starpoint Gemini 2 is its willingness to leave me alone in the universe it puts on display. Before I outline the space sim’s combat experience, a few words regarding SG2’s technical performance on my machine. As a PC exclusive, SG2 includes a number of graphics options, such as vsync on/off, anti-aliasing level, LOD distance, post-processing effects, and various detail controls. It also supports the use of gamepads. My grey-bearded—but Connor MacLeod-esque—2GB GTX 560 ti performed well with most settings on high, although as is typical with my setup, I get a substantial performance boost by switching off SSAO. I couldn’t tie the game freezes I mentioned above to any specific setting, but it appeared to begin after about 10 hours into one particular game save. Based on attention to the game’s Steam forum, the developer is actively seeking bug reports since SG2 left Early Access on September 26. There’s also a budding Steam Workshop modding community emerging, with 65 entries as of this writing. Combat takes place in all regions of space, in far-flung junk fields as well as planetary orbit. Each ship carries a threat tag that tells you what you’re likely up against, from trivial to impossible. Sometimes it’s a good decision to make a break for it, but when you do decide to engage, combat comes down to managing power for your three main systems: propulsion, shields, and weapons. Weapons systems are divided between light and heavy. Light weapons depend on battery strength and include plasma cannons, beams, and railguns. Each of these variants has a different take on rate of fire, range, and hull versus shield penetration. Heavy weapons such as torpedoes and missile turrets do substantially more damage but have limited ammunition and must be reloaded on planets and space stations. Shift more juice to the weapon banks, and your batteries powering the light-weapon turrets charge faster and allow for more consistent fire. Finding a good balance between controlling the camera with the mouse and mastering the keyboard shortcuts is vital to success against difficult opponents. And because ship movement can be linked to the keyboard or the mouse, it requires some trial and error to find the best setup. While I made the most use of the auto fire function, manual fire is just as viable, depending on the how good you are at multitasking. In my engineer pirate-killer role, I focus on upgrading my nimble, corvette-class ship to dodge incoming fire. This preserves my shields so the computer can keep firing away. There are also skills you can level up to boost weapons, create dangerous anomalies, or increase ship agility, depending on your character’s particular specialization. As you gain levels, you can apply upgrade points to your skill areas for an in-combat advantage accessed through a hotkey. Purchased items like shield boosters, repair bots, and speed buffs, among many others, add another layer of complexity to combat. What I enjoy about Starpoint Gemini 2 is its willingness to leave me alone in the universe it puts on display, while also using careful and dynamic design to ensure there’s always a new goal to chase after. Most satisfying is that I get to decide what kind of adventurer I want to be: the crusty freighter captain, the fly-by-night smuggler, or the faction outcast. It’s all there to play. SG2 gives me a dynamic backdrop, great visuals, and thoughtful music so I can build my off-world identity. It’s where I want to be. The delicate rings of Planet Trinity. Planet Pyros is hot to the touch. Planet Hogosha looks into the bright abyss. This freighter carries a worthy name, but it’s going down. Luckily a few friends stopped by to help with this Ronin Destroyer.